'OUTPOST 11' is set in an alternative past where steam power still rules the world. 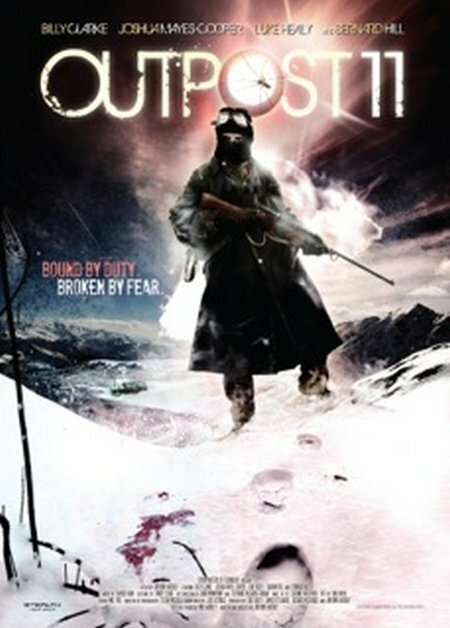 Three soldiers man a remote listening post in the Arctic Circle but one day the warning light goes off unexpectedly and their world is plunged in to chaos. Now Albert, Mason and Graham must fight the isolation, madness and arctic spiders to survive. The year is 1955 and the second 100 years war has raged on with a stalemate between the British and Prussian forces that has lasted for decades. Deep within the Arctic circle and far from the front lines an isolated British outpost intercepts enemy transmissions and works on forbidden science using steam powered technology. Most of the film is set within three rooms in the outpost which helps with the claustrophobia and isolation that the men feel and you do get to see some lovely scenery every now and again when one of the characters goes hunting for hares. There is some decent character driven dialogue but ultimately the film is far too slow and the ending leaves much to be desired. Anthony Woodley's directorial debut is a film that will have a lot of people bewildered and wondering if they missed something while watching, but you can see what he has got in him to make a film be it writing or directing. If you want to experience something away from the mainstream then 'OUTPOST 11' maybe that escape you are looking for but ultimately let us just hope that his next film will be better paced and make more sense.